Armored Saint is an American heavy metal band originating from Los Angeles, California, United States. Armored Saint was formed in 1982 by brothers Phil Sandoval (guitar) and Gonzo Sandoval (drums) with guitarist David Prichard, while attending South Pasadena High School. Next to join were singer John Bush - also a South Pasadena High School Alumnus - and bassist Joey Vera. Gonzo Sandoval came up with the name after getting stoned with the other band members and seeing the film Excalibur at a theater in Monterey Park. Armored Saint recorded a five song demo that landed the song "Lesson Well Learned" on the compilation album Metal Massacre II. Three of these demo songs were then used for the band's self-titled EP on Metal Blade Records in 1983. The group then signed with Chrysalis Records in 1984. Armored Saint released their debut album March of the Saint in 1984 followed by 1985's Delirious Nomad. The debut album yielded a minor MTV hit with "Can U Deliver?". After the release of Delirious Nomad, guitarist Phil Sandoval left the group. Their third album, Raising Fear, was recorded by the remaining four members. Unhappy with their lack of success on the Chrysalis label, Armored Saint returned to Metal Blade in 1989. Soon after the release of their first live album Saints Will Conquer the band added Jeff Duncan formerly of the L.A. club band Odin as second guitarist who is still in the band to this day. While writing and recording rough four-track demos for their next studio album, guitarist Dave Prichard was diagnosed with leukemia. Prichard succumbed to the disease before recording sessions for Symbol of Salvation began. After a brief hiatus, Phil Sandoval returned to the band to replace Prichard. The following year, Symbol of Salvation was released to widespread critical success. It featured two hits "Reign of Fire" and "Last Train Home". The album was dedicated to the spirit and memory of Dave Prichard, whose solo on the demo recording of the song "Tainted Past" was used on the album. The tour for Symbol of Salvation was successful; they opened for Suicidal Tendencies on their Lights...Camera...Revolution! tour and Savatage on their Streets tour. They also toured with Wrathchild America. In 1992, the band contributed the song "Hanging Judge" to the Hellraiser III: Hell on Earth soundtrack, as well as made a brief appearance in the film. Several months later, John Bush was offered the position of lead vocalist in the very successful thrash band Anthrax. Unsure of Armored Saint's future, Bush accepted the job. The remaining members declined to continue, and Armored Saint was officially disbanded. In 1999, with Anthrax on temporary hiatus, John Bush and Joey Vera decided to reform Armored Saint. The entire Symbol of Salvation lineup returned to the studio, and in 2000 the album Revelation was released. It included the band's first song with Spanish lyrics, "No Me Digas". A small club tour opening for Dio and Lynch Mob followed. The following year, the band released Nod to the Old School, a collection of rarities, demos and outtakes (many from the Prichard years), plus a few new tracks. Soon after, John Bush returned to the studio with Anthrax, and Armored Saint was once again placed on indefinite hiatus. In 2004, Joey Vera re-joined Bush in Anthrax on a temporary basis, replacing bassist Frank Bello. Early in 2005, Anthrax's Scott Ian announced that their classic "Among the Living"-era lineup was reforming, leaving the membership of Bush and Vera in question. Bush stated his involvement with Anthrax was over, and Dan Nelson took over vocal duties in the band in 2007. This move gave hope to many that Armored Saint would once again record. A one-off show with the Revelation lineup took place in 2005, and in 2006 the band embarked on a new tour. As part of their 20th anniversary, Metal Blade released a special edition of Symbol of Salvation. Also reissued was the band's long out of print live video A Trip Thru Red Times. The band finished recording their new album titled La Raza, which was released on March 16, 2010. On December 7, 2011, the band played the role of opening act for the 30th Anniversary of Metallica show at the Fillmore. On February 11, 2013, Joey Vera officially announced via Facebook and Twitter that the band had begun working on a new album. The album, titled Win Hands Down, was released on June 2, 2015. Win Hands Down debuted at #183 on the Billboard Top 200 chart. The album sold double what their previous effort, La Raza, sold upon its release in 2010. In Germany, the album reached #33 on the German Top 100 albums charts. John Bush was invited by Lars Ulrich to audition as singer for Metallica in 1983, following the release of their debut album, Kill 'Em All, as frontman James Hetfield was not confident in his own singing abilities and wanted to focus on playing guitar. However, Bush turned down the offer as Armored Saint was still gaining popularity at the time. In 1986 during the Raising Fear recording sessions, Metallica contacted Joey Vera to replace bassist Cliff Burton after his untimely death. It was revealed in an outtake from the documentary film Metallica: Some Kind of Monster that Phil Sandoval was involved in an altercation with Metallica drummer Lars Ulrich while attending a 1982 party. Phil pushed Lars to the ground, after which Dave Mustaine, who was still a member of Metallica at that time, got involved and ended up breaking Phil's leg. Mustaine recounts that to this day he feels bad about the incident, but that he was simply defending his bandmate. Mustaine later made amends by apologizing and giving Sandoval an ESP guitar as closure. In 1992, Armored Saint appeared in the film Hellraiser III: Hell on Earth, performing the song "Hanging Judge" in the club that Terry Farrell's character visits. 1982 Metal Massacre II Metal Blade Compilation featuring "Lesson Well Learned"
1985 Crazed - an all out metal assault JSI (Jelto Concepts Incorporated) records Compilation of various metal bands featuring "Can u deliver"
1988 The Decline Of Western Civilization Part II (soundtrack) Capitol/I.R.S. Soundtrack to the movie of the same title. Featuring "You Can Run..."
1996 Metalmeister Metal Blade Compilation featuring "Creepy Feelings"
↑ "Archived copy". Archived from the original on March 4, 2016. Retrieved October 8, 2015. 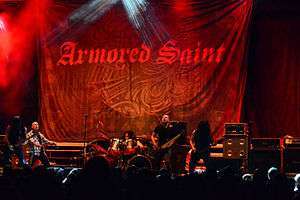 ↑ "Armored Saint To Release Win Hands Down Album In June". Blabbermouth.net. March 4, 2015. Retrieved March 4, 2015. ↑ bravewords.com. "ARMORED SAINT – Win Hands Down Debuts On Billboard Chart". Bravewords.com. Retrieved 2016-05-27.